Cancelling Spotify Premium is easy to do, and it won’t cause you lose your playlists or favourite albums. The only thing that will change on your account is that ability to listen to your favourite music offline. If you would like to re install Spotify Premium, you can do so at any time. The steps to reinstall the premium Spotify service can be found below. If you’re cancelling your Spotify Premium through your laptop or desktop computer, you can cancel Spotify in three easy steps. 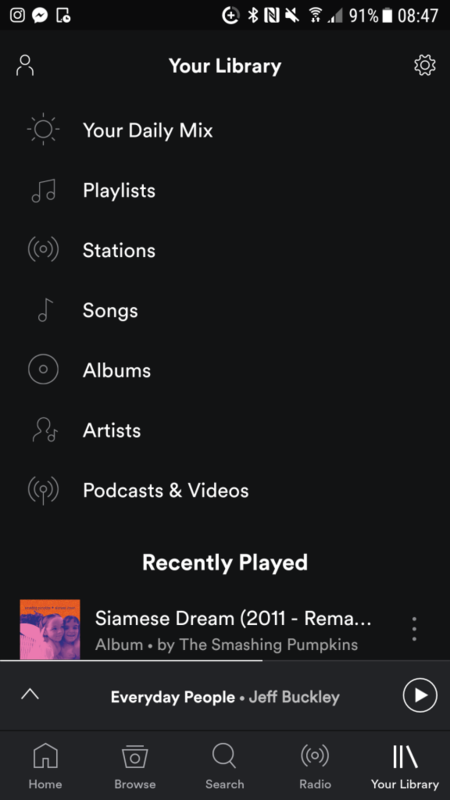 Head to your account overview when on the Spotify website. From here you will see your subscription. When you click on this, you will be taken to your plan overview. When you see your plan, you will see an option to cancel it to the right of the screen. If you’re looking to update your payment details, this is the screen from which you can do so. However, if you’re adamant on cancelling your subscription, then you can do so on this page. Once you’re sure that you want to cancel your Spotify Subscription Service, click “Yes, Cancel”, and your subscription with Spotify will end on the date in which your next payment is due. This means that you will have some extra time to listen to Spotify Premium offline if you wish to do so. If you’re using your phone or tablet to cancel Spotify Premium, it isn’t as simple as cancelling using your laptop or desktop computer in order to do so. 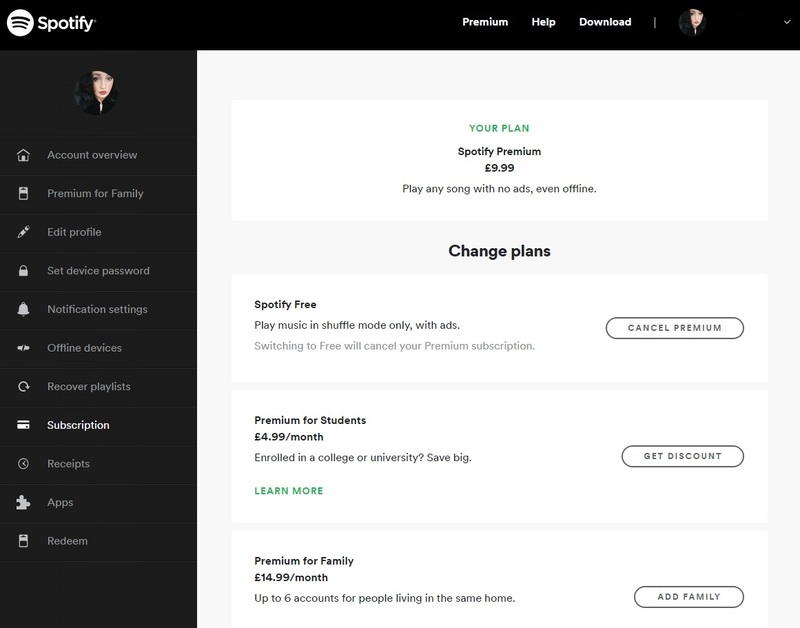 Unlike with Spotify for Desktop or Laptop, you cannot cancel your Spotify Premium account via the Spotify App. However, if you have the internet on your phone, you can log into the Spotify website and cancel it in the same way you would from your laptop or desktop. Spotify Premium is a service you can purchase from Spotify once you have made an account with them. To upgrade, simply head over to your account on Spotify and hit the upgrade tab. With Spotify Premium, you can listen to all of your favourite songs and albums offline by downloading playlists, albums, singles and more. 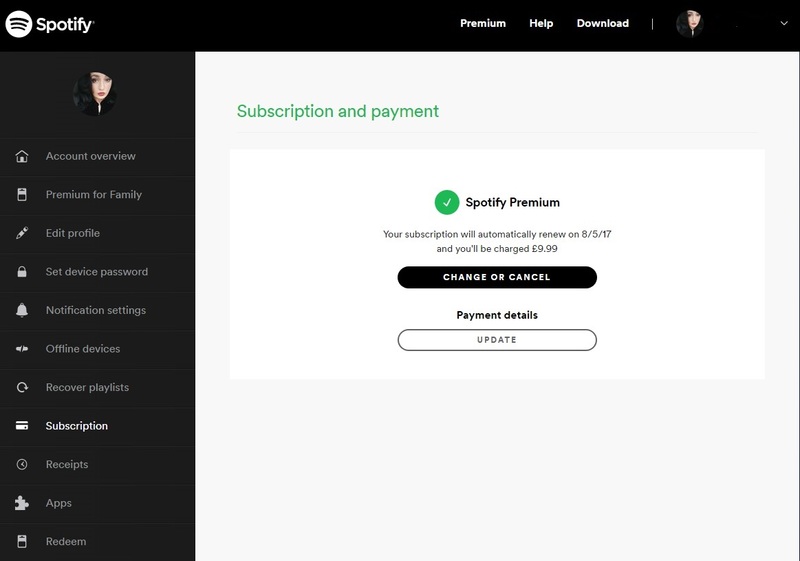 For £9.99 a month, you can subscribe to Spotify Premium by paying monthly via direct debit, or you can pay via your monthly phone bill and have it linked to your contract. 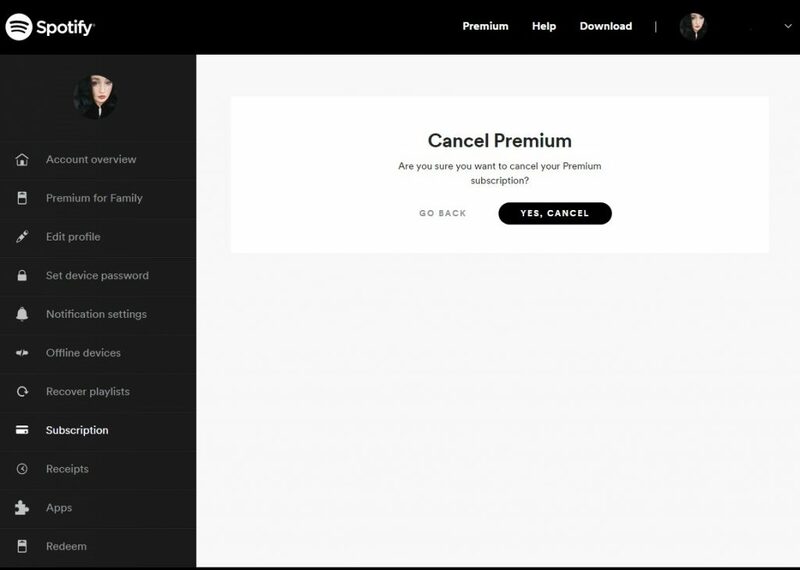 Either way, you can cancel your Spotify Premium subscription using the same method as above. If you’re in college or university, you can buy Spotify Premium for £4.99 a month with Unidays or NUS. If you would like to save mega money with Spotify Premium, you can do so with Spotify Premium for Family. This deal is £14.99 a month and can host up to 6 members of the family on their respective devices. If you’re a fan of mindfulness and would like to explore ways in which to meditate, Spotify has teamed up with Headspace in order to bring you peace of mind. Purchase Premium along with a subscription to Headspace for £14.99 a month. This will save you 25%, based on whether you would purchase both subscriptions separately. Spotify is a service designed around providing music, podcasts and videos. The service was originally released in 2008 and was originally based in Sweden. The basic service with Spotify allows users to listen to music and podcasts for free, so long as they can put up with the adverts. In order to avoid the ads, users can purchase Premium, which costs around £9.99 a month and completely wipes out the adverts. The Premium service also increases the quality of the music for its users and allows them to download playlists and albums onto their phones in order for them to listen to the service even without wifi or mobile data. Spotify is available throughout Europe, America, Australia and New Zealand. It is compatible with android, apple, window and other platforms. With the service, you can search for Artists, Bands, Albums and Song titles in the search bar. You can also search for record labels and create playlists to your heart’s content. As of 2017, the service has around 140 users online and over 30 millions song choices for them to choose from. For artists and bands, Spotify pays them royalties based on the number of streams played per song and album. Payment is done through rights holders, who then pay artists separately. Artists such as Taylor Swift and Thom Yorke have blasted Spotify in the past for this method, and refuse to have their music published on their site. In 2013, Spotify launched “Spotify for Artists”. This service allowed bands and artists to upload their music directly to the site. They are then paid directly by Spotify and not through their rights holder. This is great for unsigned bands and allows them to distribute their music in an open space. Despite its criticisms, Spotify encourages people to purchase music rather than illegally downloading. This has seen a great rise in the amount of music sold and distributed in the United Kingdom alone. In 2012, the company introduced a Follow and Discover tab. They also introduced a Collection tab. The follow tab allows users to keep up to date with artists and bands that they love. Once they follow a band, they are kept up to date with new releases and albums from the artist or band. The discover tab allows users to find bands in their favourite genre and lets them explore playlists based on their music choice. This section also allows users to see when their band or artists are next playing near them. In 2015, Spotify introduced a new interface and home page, which suggested artists and bands based on your listening preferences. Here you will also find playlists of all your favourite songs, and playlists with all of your most listened to tracks. The company also introduced discover weekly, which was a playlist of the most listened to tracks of the week, alongside popular in your country. To find tracks popular in other countries, you can simply search in the search bar or click on browse.